Dental crowns and bridges are common. In fact, according to the American Academy of Implant Dentistry 15 million people in the United States have crowns or bridges to replace missing teeth. Experienced dentist, Akbar Ebrahimian, DDS, at Premier Dental is highly trained and ready to answer your tooth restoration questions. Call or schedule an appointment online if you think you might need a crown. Premier Dental is conveniently located near you in Sugar Land, Texas. A dental crown is also called a "cap," as it's placed on top of a damaged tooth and is shaped to look like the natural tooth — it can even enhance its strength and appearance. The crown is placed on top of the original tooth, completely covering the area of the tooth that can be seen above the gum line. It's sealed in place with a special cement. A dental bridge fills in any gaps left by missing or damaged teeth by crafting a series of crowns and replacement teeth to look natural and complete your smile. Bridges are often held in place by dental crowns. Different materials are used for different purposes. For the best option of crown for you, speak with Dr. Ebrahimian and his team at Premier Dental. What are the different kinds of dental bridges? Dr. Ebrahimian advises you so you can decide which bridge is best for you. What happens in a dental crown procedure? A majority of the time, a minimum of two appointments is required to complete a dental crown procedure. During the first appointment, Dr. Ebrahimian and his team take X-rays to evaluate the condition of the tooth in question. Next, Dr. Ebrahimian uses a local anesthetic to numb the tooth and its surrounding tissue. He then files down or builds up the tooth so that the crown fits properly and securely. After the tooth is prepared, he makes an impression of your teeth, which he sends to the dental lab to construct a perfect custom crown. In the meantime, Dr. Ebrahimian fabricates a temporary crown to safeguard your tooth until the permanent crown is completed and in place. What are the steps in a dental bridge procedure? You most likely have two appointments to complete your bridge procedure. In a traditional and cantilever bridge, your teeth anchoring the bridge need to be filed down or built up for a proper fit of the crown or crowns that secure the bridge. Dr. Ebrahimian and his team take impressions of your teeth to construct your bridge and put a temporary bridge into place. On your next visit, they place the permanent bridge after contouring and adjusting it to ensure the perfect fit. If you decide to have the Maryland Bridge, your adjoining teeth do not need adjusting. The bridge is created at a dental lab, based on impressions taken during your first visit. Once finished, the temporary bridge is replaced with the permanent bridge and bonded to your adjacent teeth. If you are receiving dental implants, Dr. Ebrahimian preps the tooth and gums for surgery. He then injects a local anesthetic into your gums, blocking the pain of the dental implant procedure. After the implant is inserted, you need to heal for 3-6 months. Your next visit attaches the replacement teeth of the bridge to your healed and sturdy implant posts. Would you like to learn more about dental crowns and bridges? 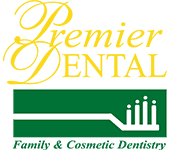 Contact the experienced professionals at Premier Dental or make an appointment online.